During our trip to Japan, my study abroad group and I mostly used the Japanese transit system to get to and from our site visits. While it was somewhat of a hassle to spend most of our money on the subway, using the Suica card relieved some of that stress. The Suica, or “Super Urban Intelligent Card” is a rechargeable smart card that you can use to pay your subway fare without the use of physical cash. 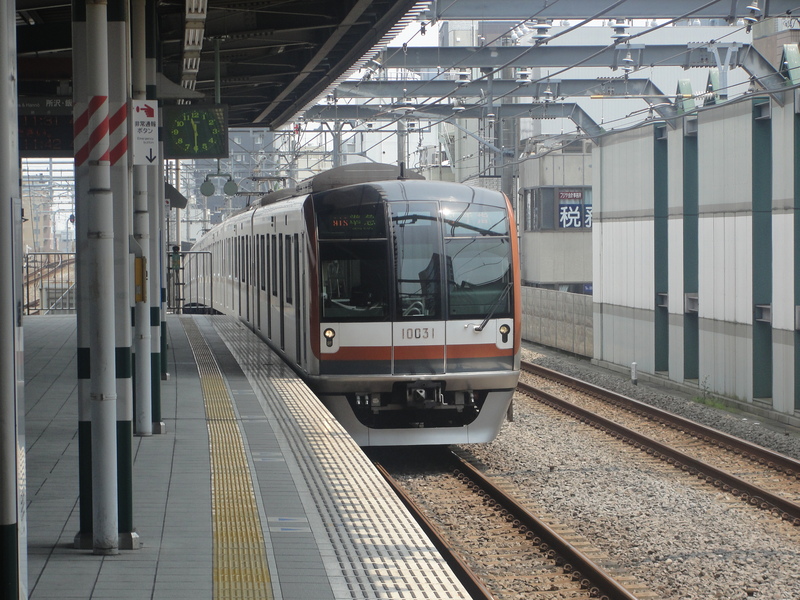 It was developed by the East Japan Railway Company, and it’s mostly used in the Kanto region of Japan. The way that you use the Suica card is that you place whatever amount of money you have on the card at one of the ticket vending machines at the station. Once that’s done, you place the card on the reader as you pass through the gate. After that, you ride the train to the next station. The fare gets taken out of the amount you originally had on the card depending on the distance from the station you started from to the station that you got off. The card uses radio-frequency identification (RFID) technology which uses radio waves to transfer information from a tag that’s attached to the card. If there’s not enough money on the card, you can pay the difference at the ticket gate. One thing that’s amazing about the Suica card is the convenience that it brings. 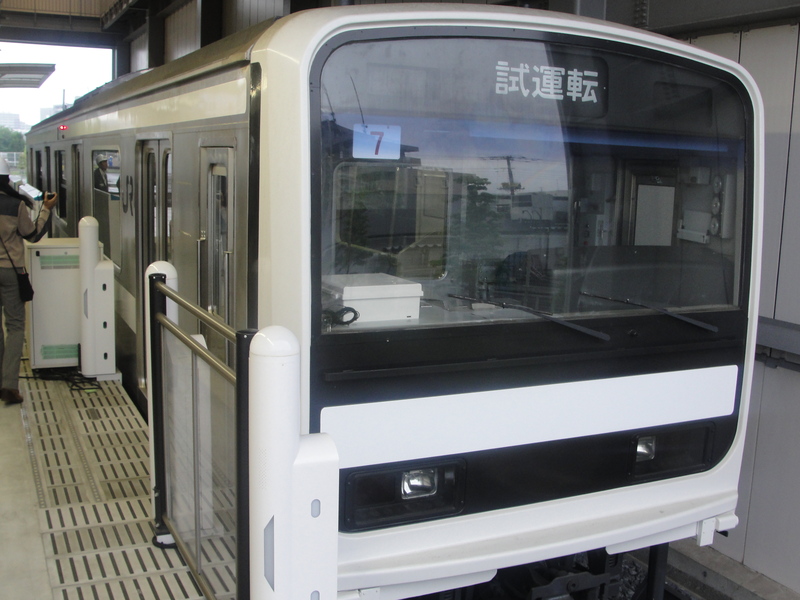 It helps relieve traffic congestion in the stations, and its really easy to use. Another thing is that not only can you use the card for getting on the subway, you can also use it to buy things. You can use the Suica at most convenience stores that carry it, and there are vending machines in the station that have card readers if you want to get something refreshing while waiting for the train. Another great thing about the Suica card is that the card has an expiration date of 10 years, so you can use the card for significant amount of time before it expires. While the Suica card is easy to use, there was one minor issue. There were a few times where I tried to use my card, and it wouldn’t scan correctly. While it wasn’t a big deal, it was somewhat frustrating not knowing what to do when this happened to me the first time. If this happens, you can go to the ticket gate, and the attendant will take care of the situation. 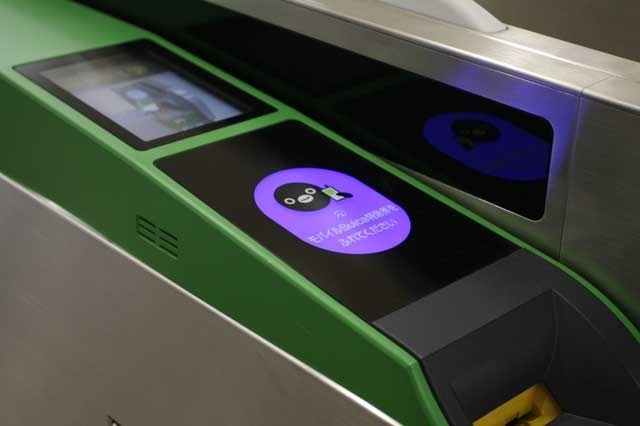 JR East also developed a version of the Suica that can be used on mobile devices. Just like the card, you can put money on it and use it to pay your subway fare and to buy snacks at the convenience stores. The only major difference is that the mobile version of the Suica allows you to view most of your past purchases. 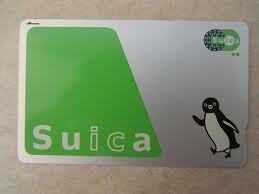 Using the Suica made my experience with the Japanese transit system a lot more convenient. It’s really simple to use, you can use it to ride the train and buy food, and it saved me some money. It would be great to see the U.S. use RFID technology in this particular way someday, it would definitely make things a whole lot easier. 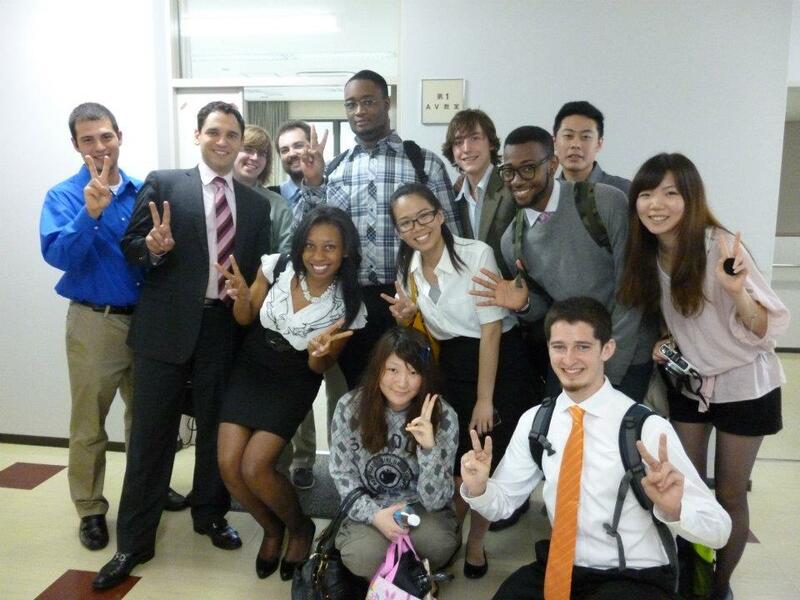 It’s really sad that my journey in Japan is over, it was an truly awesome experience that I will never forget. I’ve met some really interesting people, I got the chance to visit places that most people dreamed of visiting, and most importantly, I fulfilled my dream of actually going to Japan. I’ve really learned a lot from all of the companies we went to during our trip, but I also learned a little bit about myself as well. Being out of the country for two weeks made me realize that there’s a whole world to explore, new things to experience, and new connections to make. I really would like to do more traveling in the future, I realize now that the world has a lot more to offer. If I do decide to travel more, I’m definitely coming back to Japan. There’s a lot I’ve missed the first time around, I really wanted to see more of Kyoto, and I would also like to see Mt. Fuji as well. I’m really grateful that I had the opportunity to be on this trip, and hopefully the people who read this blog get inspired to get out of their comfort zones, and expand their horizons. We had a busy day ahead of us during our last day in Japan. The first company we visited was Dai Nippon Printing. 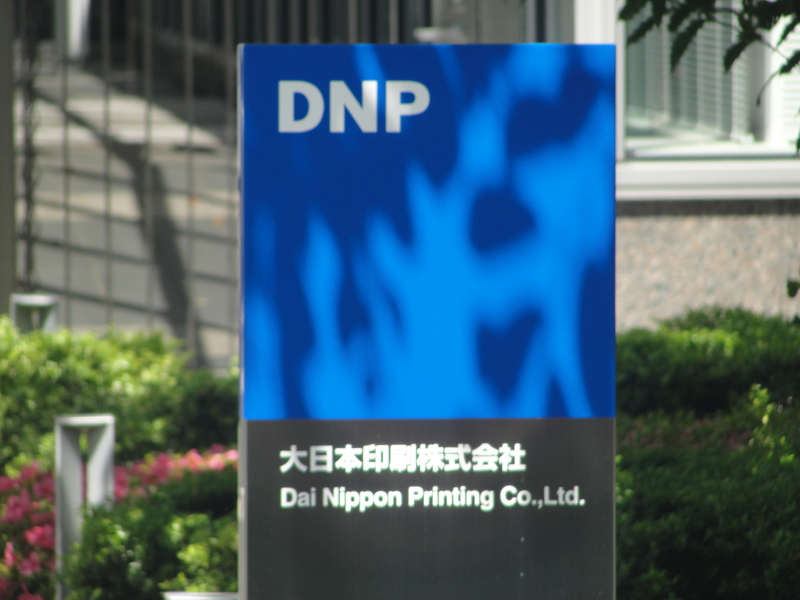 One interesting fact about DNP is that it started out as a printing company originally, but since then the company changed its focus to information services. 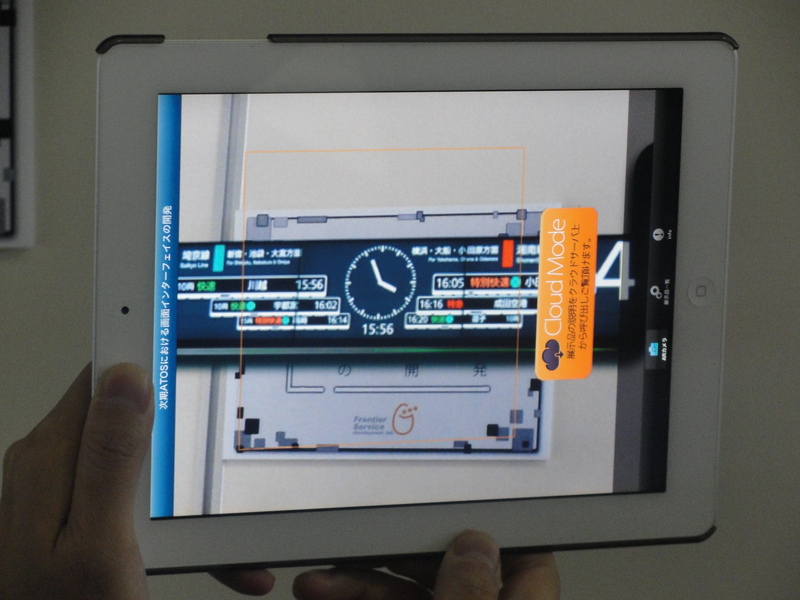 DNP is another company that’s using Augment Reality technology. Ironically enough, they’re actually working with JR East to create the app that uses 3D maps for their stations that I mentioned in the last post. I really would like to see Augmented Reality technology used more in the U.S., there are a lot of companies that can benefit from using this technology for their products. Afterwards, we got to see a mini interactive art exhibit that DNP had in partnership with the Louvre Museum. The art exhibit was pretty interesting, there were many touch displays that showed information on some of the paintings in the actual museum. In one of the rooms, we actually one of the paintings that the Louvre donated to the company for the exhibit. There was a interactive kiosk that lets you edit the painting any way you want it to look. It would be interesting to see if other museums decide to have interactive exhibits in the future. It’ll be a great way to learn about the subject matter of the exhibit, and it would be a lot more engaging than just looking at the exhibits themselves. Our trip to the Research and Development center for the East Japan Railway Company (JR East for short) was probably the most interesting of all the places I’ve been to. It was somewhat weird to hear a railway company talking about innovation, but I was really impressed with some of the things they showed us. JR East is one of seven railway companies that make up the Japan Railways Group, who were originally the Japan National Railways, which was privatized on April 19, 1987. 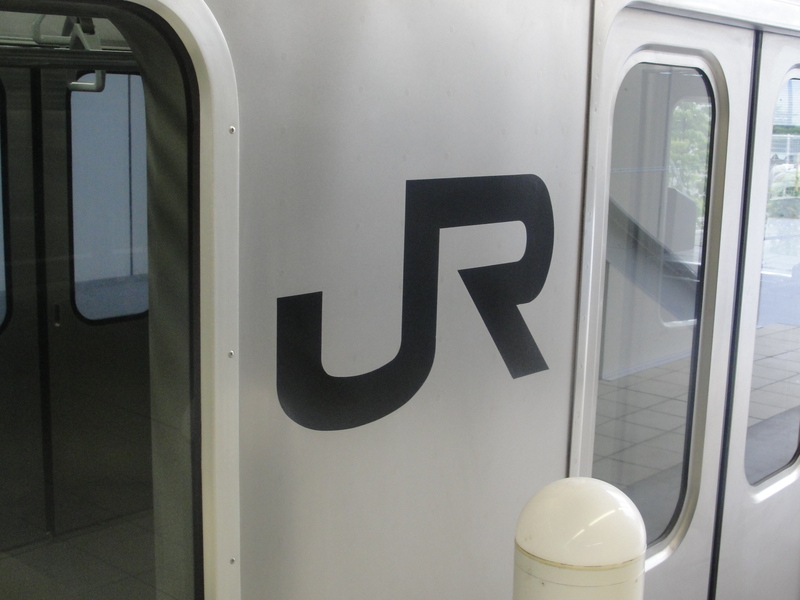 JR East employs 59,650 people, their group revenue for 2011 was $30 Billion, and they serve 16 million passengers daily. While we were there, we had the chance to try out some of the prototypes they’ve been working on. As a bonus, they even allowed us to take pictures of their prototypes. One prototype that stuck out the most to me was the Kamishirube (kami- paper, shirube- directing post) information station. Kamishirube allows users to look up different information by placing your brochure on the kiosk and tapping the icons that pop up. If this type of technology ever gets implemented, it’ll be a great way for people find their destination in the train station. Another thing that they showed was the Smart Navigation app, which allows you to see a 3D map of the station by holding your mobile phone in front of a AR (Augmented Reality) marker. The app is only being made for the Japanese market, but it’ll be interesting to see if it ever gets released in America one day. I really had an awesome time at JR East, it’ll be awesome to see all of the technology that I saw to be put into use when I come back to Japan. 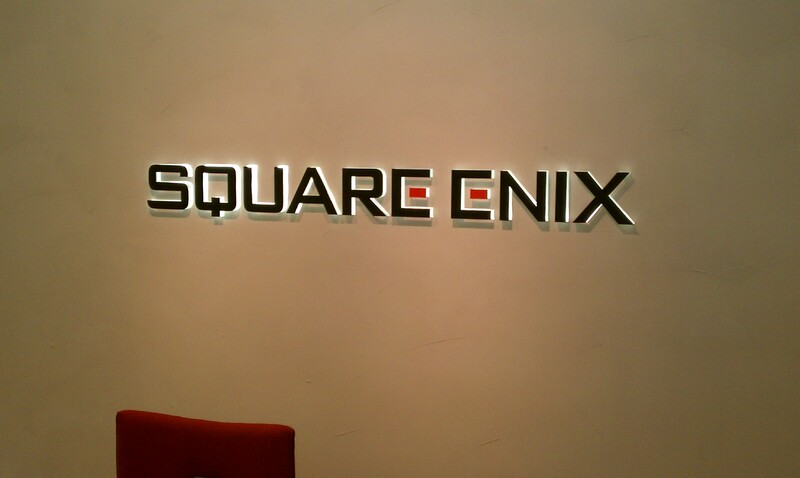 After our visit to iNiS, we went to visit the good folks at Square Enix. Square Enix is the developer that’s most famous for creating both the Final Fantasy and Kingdom Hearts series, as well as many other famous franchises. Unlike iNiS, Square Enix wasn’t as open with us about some of the things they were working on due to the fact that they’re a big name game developer. Originally, Square Enix were two separate companies: Square and Enix. Both companies dealt primarily in gaming, with the exception of Enix who also produced anime and manga (Japanese comics/graphic novels). 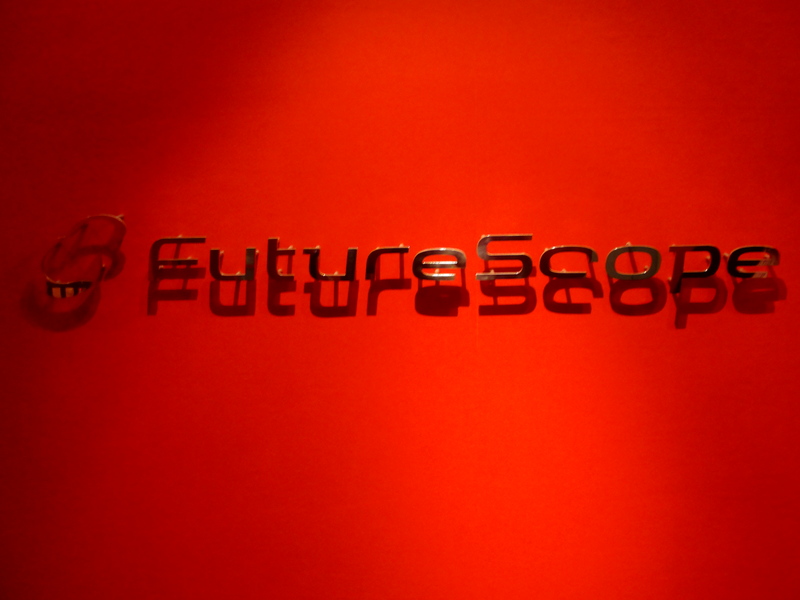 We learned a little bit about the company and its subsidiaries. Some of the companies that Square Enix own includes Taito Corporation, who created Space Invaders and other arcade titles, and Edios Interactive, who is best known for the Tomb Raider and Hitman franchises. We actually got a peek at some of the technology that they use to make some of their games, which was interesting to say the least. We also had the chance to see a tech demo that the company was working on that showed how games might look in the next generation. The footage that I saw was pretty amazing, it’ll be interesting to see if the graphic capabilities of game consoles actually have that type of realism that I saw in the tech demo. After that, we actually got a tour of their facility. Unfortunately, we weren’t allow to take any pictures, but it was cool to see the actual place where Final Fantasy is made. Overall, I really learned a lot from our visits to both iNiS and Square Enix. Hopefully, this knowledge will help get one step closer to having a job in the game industry. During our last leg of the trip, we finally got a chance to visit some video game developers. As someone who is trying to get a job in the game industry, getting the chance to visit an actual game company is a dream come true. 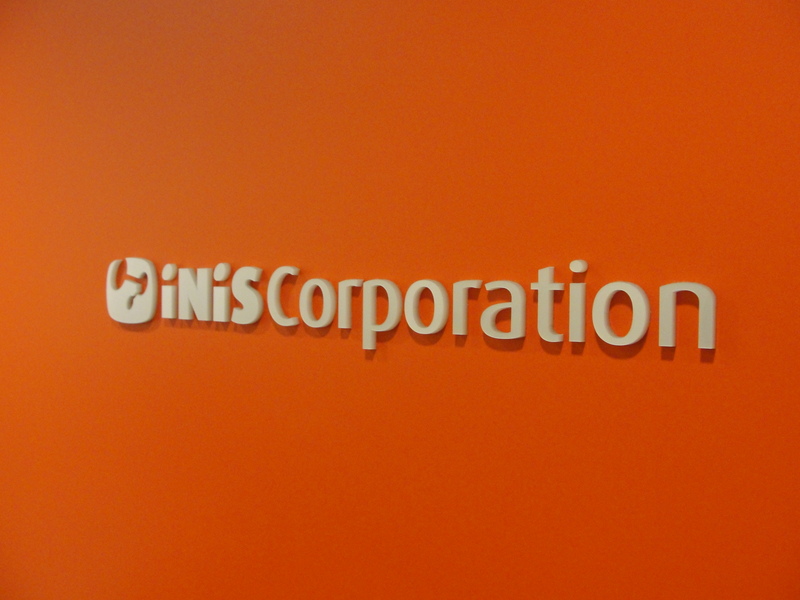 The first company we visited was iNiS Corporation, which is a company that specializes in rhythm games. For those that aren’t gamer-savvy, a rhythm game is a game that determines how well a player sense of rhythm is. Some popular games within this genre include Dance Dance Revolution, Guitar Hero, and Rock Band. iNiS was founded on September 3, 1997, and the name “iNiS” actually stands for “inner Noise of the inner Soul”. Some of their titles include Gitaroo Man for the Playstation 2, Elite Beat Agents for the Nintendo DS, and most recently the Xbox 360 version of The Black Eye Peas Experience. While iNiS is a relatively small comapany, they have worked with some of the of the well-known developers. I also learned that they actually use the Unreal Engine the create some of their music games, which was really interesting in terms of how most of the games developed using Unreal are mostly action titles. We then had the chance to try out some of their games, which are pretty fun if I do say so myself. I had a pretty awesome time visiting iNiS, hopefully I might work for them someday. During one of our free days, me and a few friends went to Odaiba. Odaiba is a man-made island that has lots to do and see there. There were a few of malls, a giant Ferris wheel, and even a replica of the Statue of Liberty. But that wasn’t the reason why we went. 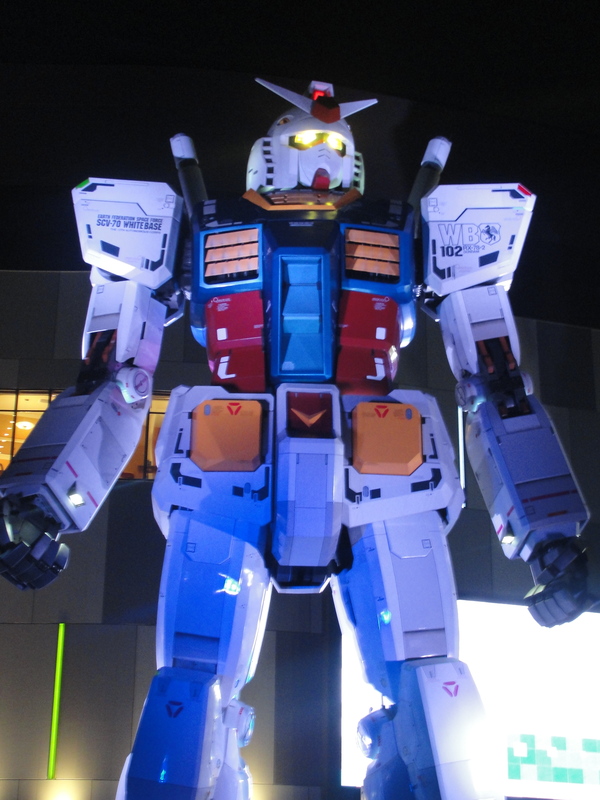 In front of Diver City (one of the malls on the island) was the giant Gundam statue. For those that don’t know about Gundam, the franchise was created by Yoshiyuki Tomino in 1979 with the release of the anime Mobile Suit Gundam. Since then, the Gundam series has become one Japan’s most popular franchises spanning many anime series, video games, and models kits. 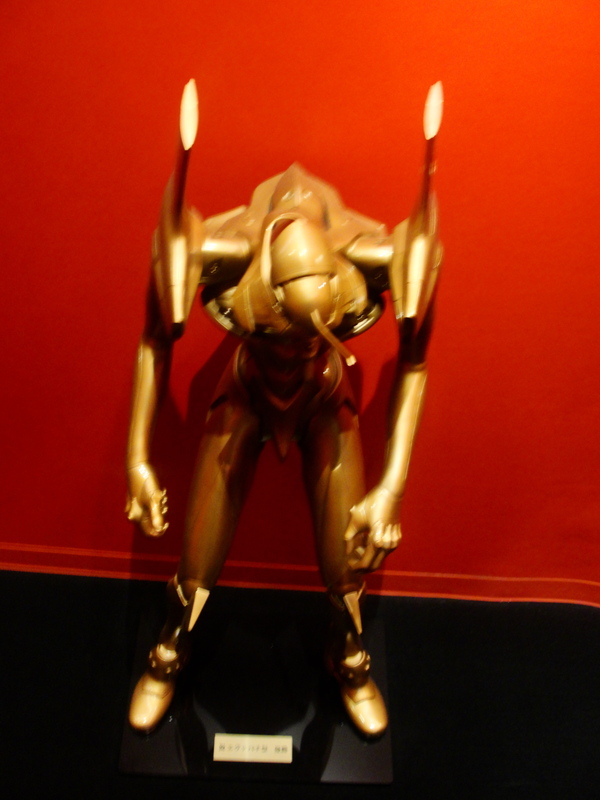 The statue was built to commemorate the 30th anniversary of the series, and seeing this thing up close is nothing short of amazing. 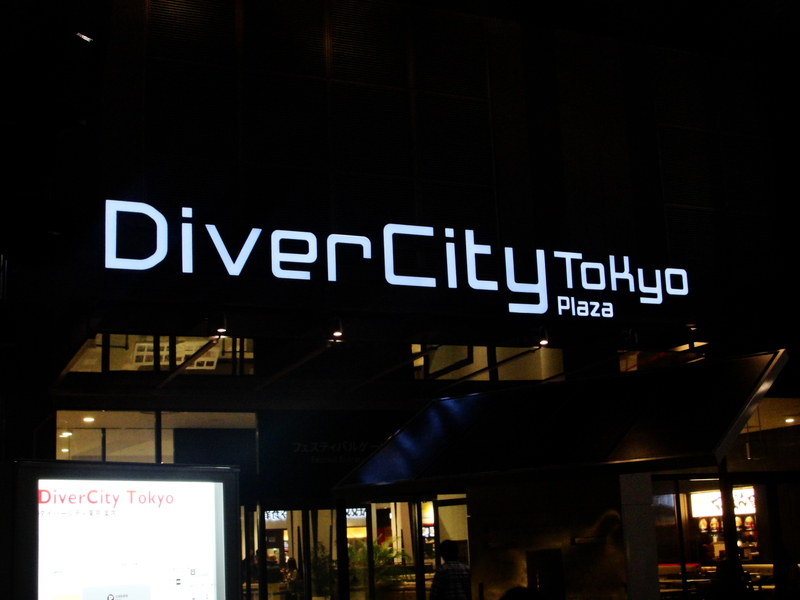 Diver City itself was pretty amazing as well. The mall was like a combination of Great Lakes Crossing and the Mall of America put together, that’s how huge it was. The mall has seven floors, and there many stores on each of the levels. 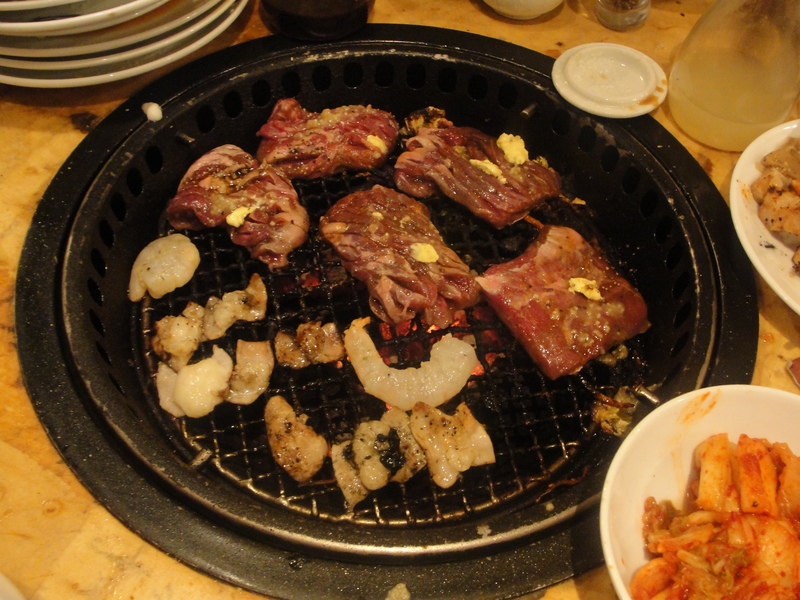 There was also a floor that had nothing but restaurants, there was even a grocery store on that floor. 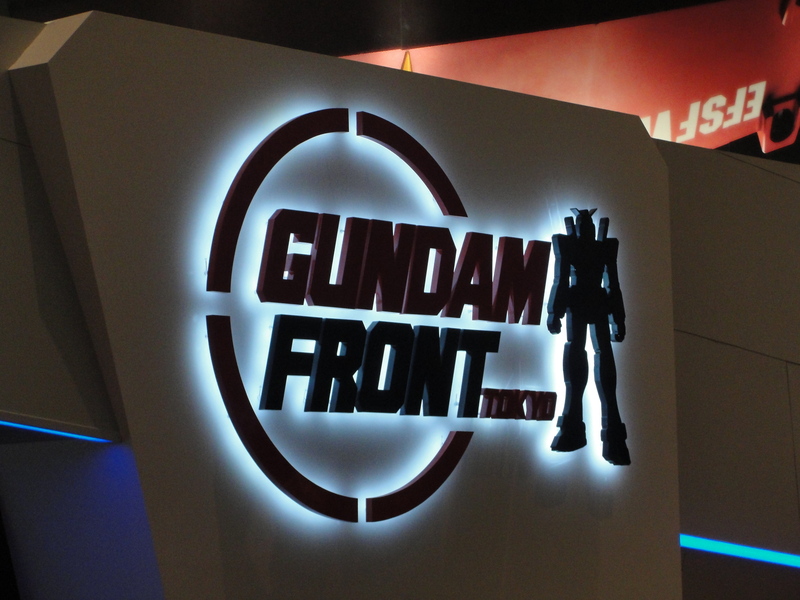 On the seventh floor, there was Gundam Front Tokyo, which is a museum dedicated to telling the history of the Gundam franchise. Once we got inside, there was a lot to see. We saw a timeline that gave details about each series in order of release, also we got to see actual storyboards from the original series. There was also some type of kiosk were you can look at character profiles from each of the different shows in the entire metaseries. 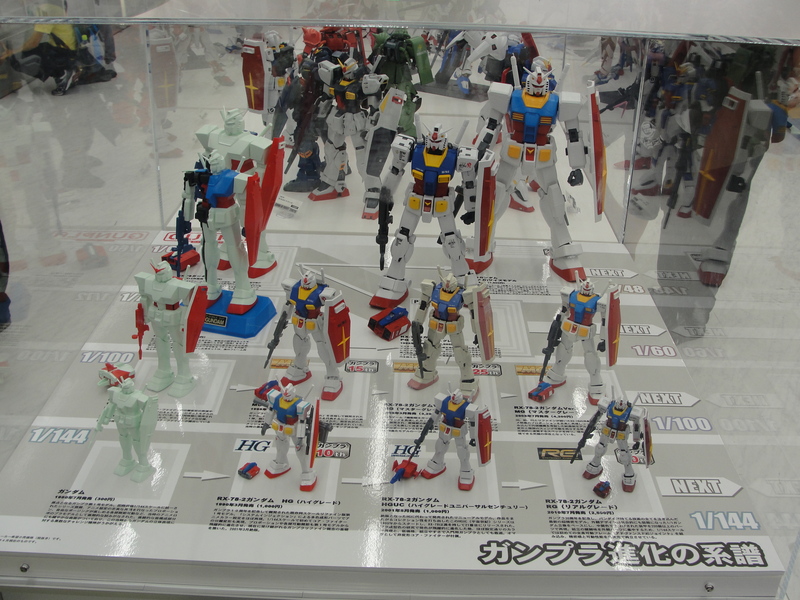 One thing that was impressive about this place was the gallery of Gundam models near the entrance. There were big models, small models, and a few models of the spaceships that were used in the multiple shows in the metaseries. It’s interesting to see a franchise like Gundam to have such an impact on a country’s culture, but I find it a little disheartening that there isn’t a franchise that has such significance in the U.S.
NTT DoCoMo: Their Technology Level is OVER 9,000!!! 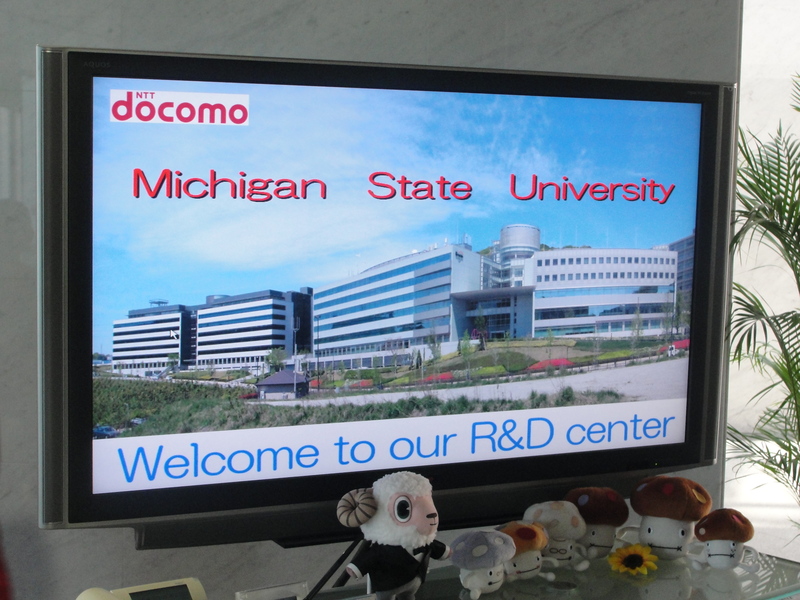 Visiting NTT DoCoMo is arguably one of my favorite companies we visited during our trip to Japan. 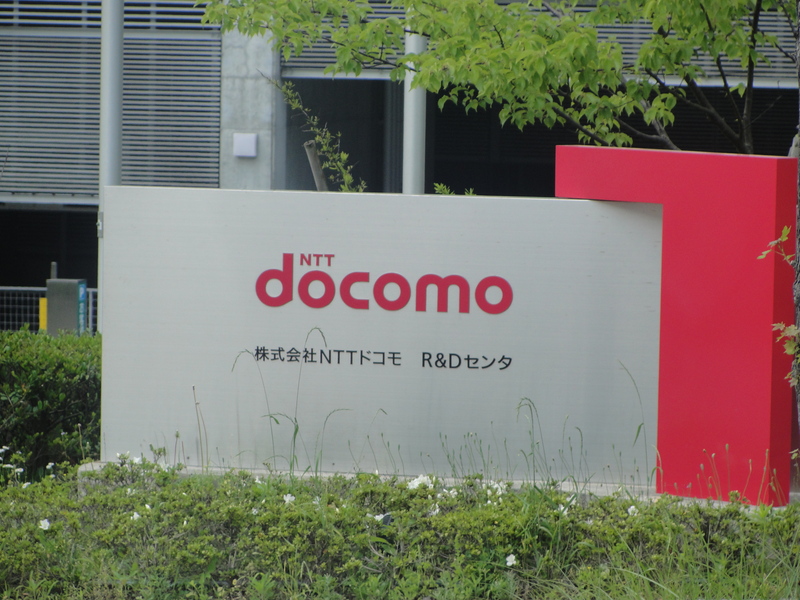 DoCoMo is the leading mobile phone provider in the country, and after witness some of their technological innovations, I can see why they’re so deserving of that title. We visited the company’s Research and Development lab, and one thing I can say is that the United States has some catching up to do in terms of mobile technology. The amount of technology they had to offer was amazing. 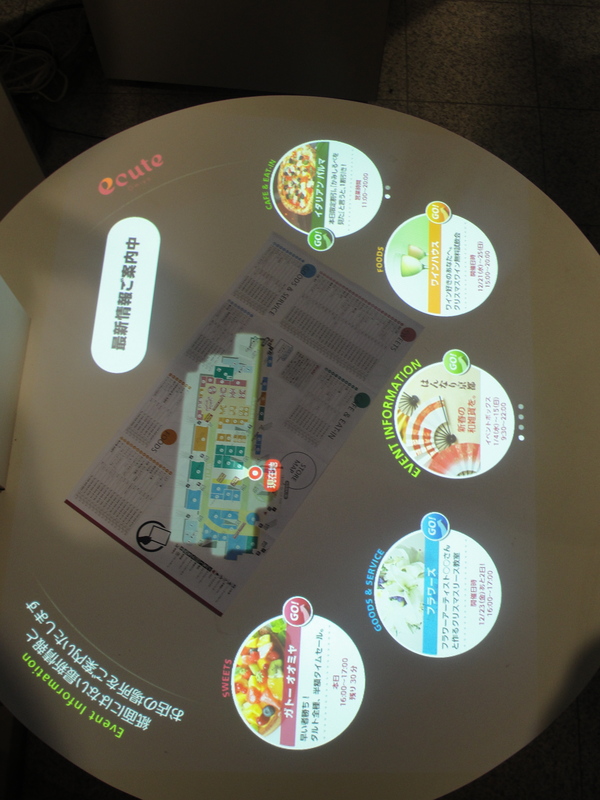 Some prime examples included a mobile app that can tell if your hungry or not, a ring that allows you to turn on the TV by tapping your index finger and thumb in a specific sequence, and a translator that can translate whatever you say into any language. But one of the innovations that drew my attention the most was a pair of augmented reality goggles. To those that don’t know what augmented reality is, it’s basically a type of technology that allows you to view 3D images in a real world environment. These goggles allowed you to view a magazine without turning a page, also they allowed you to view a 3D map of a city. I’ve only seen augmented reality used in gaming like with the releases of the Nintendo 3DS and PlayStation Vita handhelds, but to see it used in such a way was awesome. While augmented reality isn’t as prevalent in the U.S., it was cool to see the Japanese use the technology in other areas other than gaming. It’ll be interesting to see if this specific product, and the other innovations I’ve seen will make the market one day. I didn’t realize how much I would miss the buses back in East Lansing. Riding on the subway trains in Japan takes a lot of patience, which is kind of hard when the train is filled to the brim with people. Japanese subway stations are probably one of the most busiest places I’ve seen during my trip. Depending on the station, everywhere you went there was sea of people trying to get to their respective trains. We also rode a few buses trying to get to some of our site visits as well, and they too can be packed. I’m used to riding on a packed bus, but this was on a whole new level. During our trip to Kyoto, the bus was so packed I had a hard time trying hang on to the railings. But my experience with the Japanese transit system wasn’t all bad. 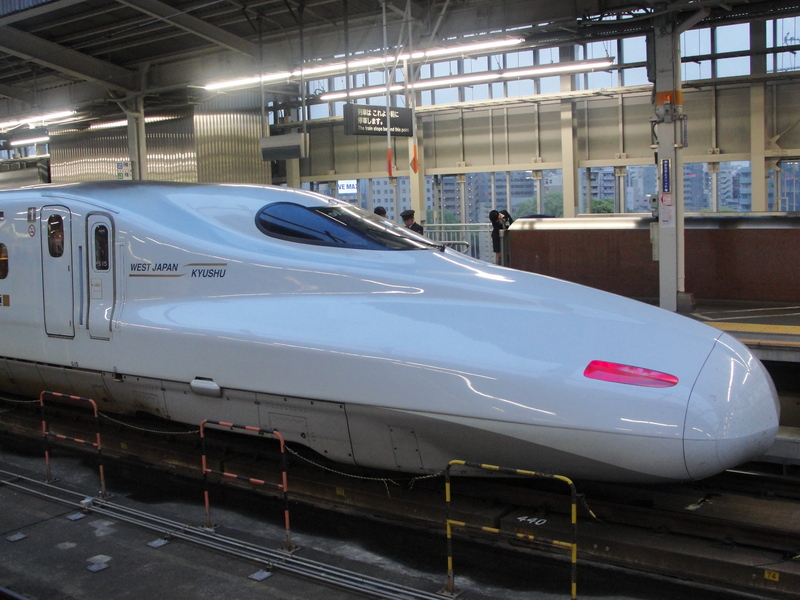 I got to ride the Shinkansen (bullet train) a few times during our trips to and from Osaka. The main difference between riding on the Shinkansen opposed to the subway trains is that it’s sort of like riding on an airplane that’s really low to the ground. These trains are incredibly fast with speeds ranging from 186 mph. Riding on the Shinkansen can be a lot more relaxing than riding on the subway trains, which is great for long train rides. Another great thing is that these trains aren’t packed all the time! It would be great if the subways mostly used Shinkansen. People would get to their destinations much faster, and a big guy like me wouldn’t have to worry about falling on someone if the train makes a sudden stop.